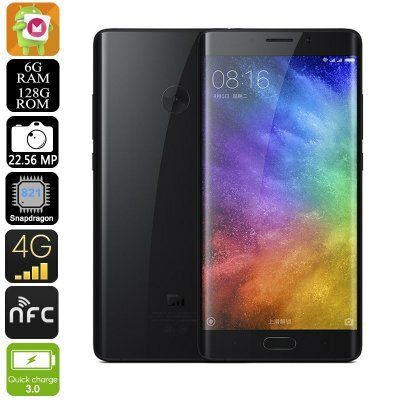 Successfully Added Preorder Xiaomi Mi Note 2 Smartphone - Global Edition, 4G, Snapdragon CPU, 6GB RAM, Android 6.0, Quick Charge (Black) to your Shopping Cart. This Product is a Pre-Order Product that is expected to be shipped on the 30th of December. Do not order with other products.This is a Pre-Order product and as such the weight, dimensions and specifications of this product could be subject to change.We will update the listing when the product is received in stock. The Xiaomi Mi Note 2 has some familiar but none the less stunning features that make this new flagship device from Chinese phone makers Xiaomi is a breath of fresh air. At first glance you will be sure to notice the curved glass screen, or as Xiaomi call it 3D Glass. this is present on both the front and rear of the device and wraps around to the metallic sides. This 3D curved glass and metal finish leave the phone looking very sleek and means the 5.7 inch HD OLED screen flows right from the very edge. Taking advantage of Quick Charge 3 technology means that the phone's 4070mAh battery can be charged to about 80% in around 30 minutes and thanks to the efficient full HD display this phone isn't as power hungry as many other devices in its class so will allow for some impressive usage times so you won't have to worry about the phone running out of power part way through the day. When it comes to the cameras on this phone you'll get a respectable 8MP camera on the front while the rear of the phone boasts a 22.56MP shooter. This is a fantastic camera that not only takes great quality photos but can record movies in up to 4K resolutions. Xiaomi has their own operating system running on the Mi Note 2 Smartphone, this is the MIUI 8 operating system and is based on Android 6.0. It is an easily navigable system with all the familiar features exactly where you'd expect them but incorporates a few nice changes and tweaks to make it, even more, user-friendly. The Xiaomi Mi Note 2 Global edition comes with 12 months warranty, brought to you by the leader in electronic devices as well as wholesale Android phones..